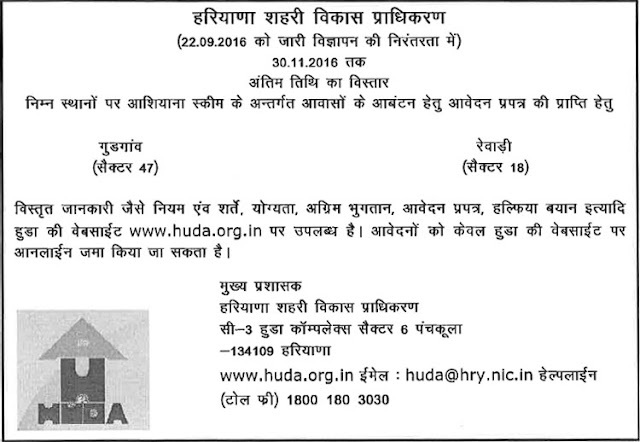 HUDA Ashiana Scheme 2016 at Gurgaon and Rewari: A decision has been taken decision to extend the last date to register for BPL/EWS flats in HUDA Ashiana Flat Scheme 2016 upto 30 November 2016. 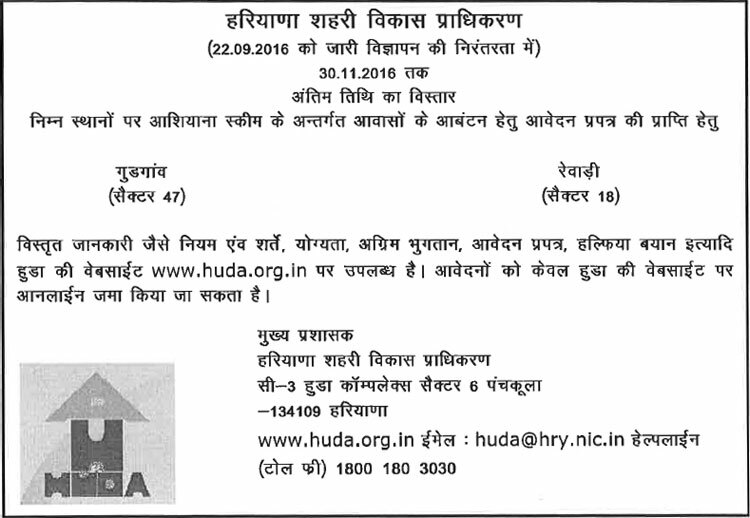 Haryana Urban Development Authority has published a notification on HUDA official website. In this notification, the authority has mentioned that the last date of HUDA Ashiana housing scheme 2016 at Sector-47 Gurgaon & Sector-18 Rewari. Under the scheme, 1496 flats are being offered for allotment of which 1088 flats are located in Sector-47 Gurgaon (Gurugram) and only 408 are located in Sector-18 Rewari. Interested people can fill the application for these flats only through online mode by using the official website www.huda.gov.in. Complete details like how to apply, eligibility criteria, brochure and application form etc can be obtained from the official website.